In today’s modern world of retail, e-Commerce and Point of Sale integration is something all retailers need to consider if they want to take their business to the next level. Not only does integration streamline the shopping experience for your customers but it also has a lot of benefits to help you manage your business: its ultimate goal is to increase your revenue potential while reducing your operating costs. Control your inventory, vendor data, and product details. Plus, your staff won’t have to manually enter product data from POS to eCommerce, sales orders from eCommerce to POS, shipping information, and tracking status from POS to eCommerce channels. They also won’t have to spend time monitoring multiple systems and cleaning up data entry errors anymore: this saves you labor costs, saves your staff major headaches, and gives your customer exactly what they want. Quickly access your customers’ name, address, and order history. Track analytics, ad feeds, social media, and e-mail. Simplify your warehouse management and picking & packing orders. Keep track of sales, purchases, expenses, payroll, budgeting, & reporting in one place. Improve efficiency with time clock, attendance, & employee tracking. Manage workflows and scheduling easier with the ability to calculate sales by employee, by work shift, etc. 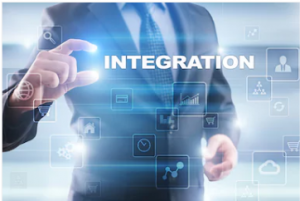 And, integration frees up your executive or management staff, leaving more time for staff development, improved operations, and exploration of new sales avenues. With data entry removed from the equation, integration puts all your information into only one system. This makes it easier for your existing staff and gives any new staff that you bring on less of a learning curve. Revel in the joy of consistent data, synchronized from your single integrated system to any other systems you may have. Having separate databases for e-mail marketing, inventory control, or order management opens your applications up to the potential of falling out of sync. Keep your product inventory, pricing, and promotions consistent and make price adjustments in a single location to see the results business-wide. Flexible, easy-to-use reporting options help you to maintain a competitive edge and maximize your revenue opportunities. The tracking components of your system integration keep you updated on everything you need to know: exactly which products sell the best and when you need to buy or discount something. You can also track your advertising, customer mailings and promotions, discounts, etc. to monitor all of your investments and their direct benefit to your business. Not only that, but you’ll also be able to introduce new products to the market quicker. Fully synchronize new and trending products across all of your sales channels, faster and more accurately – giving your products the opportunity to gain exposure through search engines before their competitors. Be the first to market. Online retailers and brick and mortar shops can mutually find struggles in inventory management. If you’re doing both, it’s absolutely necessary for you to find the perfect balance of eCommerce and POS system integration so you can run a more efficient business.